THIS WAS MADE IN 2004 BY SIDESHOW COLLECTIBLES IN THERE CIVIL WAR BROTHERHOOD OF ARMS LEGENDARY ICONS SERIES OF CIVIL WAR SOLDIERS. 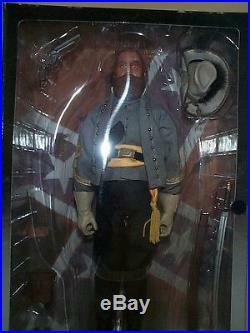 THIS IS A GREAT LIFE LIKE PORTRAIT FIGURE OF CONFEDERATE ARMY CAVALRY GENERAL J. 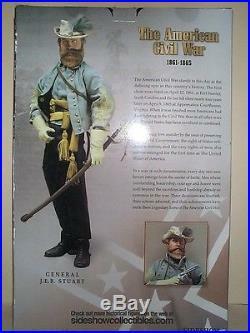 THIS 12 INCH CONFEDERATE SOLDIER FIGURE IS ONE OF THE MOST HIGHLY DETAILED HISTORICALLY ACCURATE 12 INCH SIZE 1/6TH SCALE FULLY JOINTED ACTION FIGURE SOLDIERS EVER MADE. HE IS BRAND NEW CONDITION MINT IN THE SEALED BOX HE CAME IN AND HAS NEVER BEEN OPENED OR USED IN ANY WAY WHAT SO EVER. 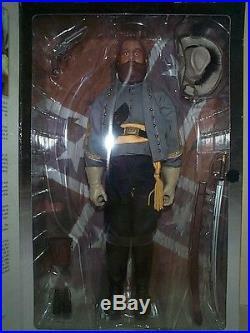 HE COME WITH ALL THE CIVIL WAR CONFEDERATE ARMY UNIFORM, WEAPONS, EQUIPMENT AND GEAR SHOWN IN THE BOX. WHICH INCLUDES CS OFFICERS DOUBLE BREASTED SHELL JACKET, MILITARY VEST, DARK BLUE TROUSERS WITH GOLD STRIPES, SLOUCH HAT WITH FEATHER, CAVALRY SASH, HIGH CAVALRY BOOTS WITH SPIRES, CS SABER BELT WITH OFFICERS BUCKLE, LEATHER GAUNTLETS, FRENCH PATTERN LIGHT CAVALRY SABER WITH SABER KNOT AND SCABBARD, FIRST MODEL LE MAT PISTOL AND HOLSTER AND BINOCULAR WITH BINOCULAR CASE. 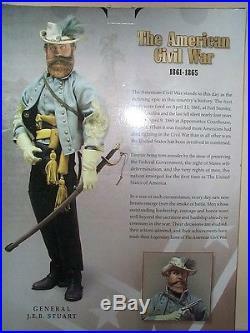 YOU WILL NOT BE DISAPPOINTED IN THE QUALITY OF THIS GREAT LOOKING HISTORICAL SOLDIER FIGURE. WE HOPE YOU WILL UNDERSTAND. WE DO NOT AGREE WITH THEM AT ALL! 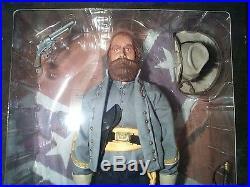 The item "SIDESHOW 12 INCH CIVIL WAR CONFEDERATE ARMY CAVALRY GENERAL J. STUART MIB" is in sale since Thursday, April 26, 2018. This item is in the category "Toys & Hobbies\Action Figures\Military & Adventure". The seller is "mytoys6" and is located in Danvers, Massachusetts. This item can be shipped worldwide.